Not to be confused with Kate O'Mara or Rooney Mara. Kate Rooney Mara (/ˈmɛərə/ MAIR-ə; born February 27, 1983) is an American actress and fashion model. She is known for playing reporter Zoe Barnes in the Netflix political drama House of Cards (2013–2014; 2016), computer analyst Shari Rothenberg in the Fox thriller series 24 (2006), and Ben Harmon's vengeful mistress Hayden McClaine in the FX horror miniseries American Horror Story: Murder House (2011). She made her film debut in Random Hearts (1999). She has since appeared in Brokeback Mountain (2005), We Are Marshall (2006), Shooter (2007), Transsiberian (2008), Stone of Destiny (2008), The Open Road (2009), Transcendence (2014), The Martian (2015), Fantastic Four (2015), Morgan (2016), Megan Leavey (2017), and Chappaquiddick (2018), portraying Mary Jo Kopechne. Kate Rooney Mara was born and raised in Bedford, New York, on February 27, 1983. Her parents are Timothy Christopher Mara, an NFL scout and vice president of the New York Giants for player evaluation, and Kathleen McNulty Mara (née Rooney). She is the second of four siblings, with one older brother, Daniel; one younger sister, the actress Rooney (born Patricia); and one younger brother, Conor. Mara's father has Irish, German, and French Canadian ancestry, and her mother is of British and Italian descent. She is a great-granddaughter of both New York Giants founder Tim Mara and Pittsburgh Steelers founder Art Rooney, Sr. Her mother's side of the family has held ownership in the NFL's Pittsburgh Steelers football team since its formation in 1933, and her father's side of the family has held ownership in the NFL's New York Giants since its formation in 1925. Her paternal grandparents were Wellington Mara and Ann Mara. Wellington co-owned the Giants football team from 1959 until his death in 2005, and was succeeded by his son (Kate Mara's uncle), John Mara, who is currently President, CEO, and co-owner of the team. Kate Mara's maternal grandfather, Timothy James "Tim" Rooney, has run Yonkers Raceway in Yonkers, New York since 1972. Her granduncle, Dan Rooney, chairman of the Steelers, was a former United States Ambassador to Ireland and the co-founder of the charitable organization The Ireland Funds. Her first cousin, once removed, Art Rooney II, is the current President and co-owner of the Steelers. Mara began acting at the age of nine in a school musical. She attended several youth theater-arts schools and appeared in community theater and in school plays. Mara has described herself to Esquire magazine as having been "painfully shy" while growing up, adding that she only had one friend. Her first audition was for the NBC police drama Homicide: Life on the Street. She did not get the role but knew from then on that she just wanted to act. Mara graduated from Fox Lane High School a year early and was accepted into the Tisch School of the Arts at New York University to study musical theater, but she eventually deferred her slot to work as an actress. Mara's first television role was in the NBC legal drama Law & Order in 1997. She went on to guest star on numerous television series, including Madigan Men, Ed and Law & Order: Special Victims Unit. Mara landed two recurring roles in 2003, as Kate on Everwood, an 18-year-old who is impregnated by her piano teacher and then gets an abortion, and as Vanessa on Nip/Tuck, a bisexual cheerleader involved in a love triangle with her boyfriend Matt McNamara (John Hensley) and another cheerleader (Sophia Bush). Mara also appeared on Cold Case, Boston Public, CSI: Miami and CSI: Crime Scene Investigation that same year. Mara was cast as the lead in the 2004 The WB pilot Prodigy, about a teenage child prodigy. She had a recurring role on the WB's Jack & Bobby in 2005 and a five-episode arc on the Fox TV series 24 in 2006, playing computer analyst Shari Rothenberg. Mara joined the cast of the HBO comedy-drama Entourage for the series' sixth season in 2009. She played Brittany, Eric "E" Murphy (Kevin Connolly)'s assistant at his talent-management company and a potential love interest. Mara filmed four episodes for the series in 2009. In 2011, she guest starred on the FX horror series American Horror Story, as Hayden McClaine, a student who becomes Dr. Ben Harmon (Dylan McDermott)'s dead mistress, a spirit trapped in the Harmon house. Mara was offered the role by Ryan Murphy, her former producer on Nip/Tuck. She made her stage debut in 2003 at the Williamstown Theatre Festival in John Guare's Landscape of the Body with Lili Taylor. Mara starred in The Alice Complex, a play by Peter Barr Nickowitz, at Dixon Place in New York City in 2005 and at the Blank Theatre in Los Angeles in 2006. The production co-starred Tony Award-winner Harriet Harris. She later told WFAN radio in 2006 that doing more theater work is a "dream" because it was "all I really wanted to do as a kid. I didn't care about movies or TV, I just wanted to do Broadway". Mara made her film debut in Random Hearts, with Harrison Ford in 1999, directed by Sydney Pollack. She played Jessica Chandler, the daughter of a congresswoman (Kristin Scott Thomas). She next appeared in the Sundance Film Festival award-winning films Joe the King (1999) and Tadpole (2002), alongside Sigourney Weaver. Mara co-starred in Peoples (2004), a drama and coming of age story filmed in Louisville, Kentucky. She starred in the direct-to-video horror film Urban Legends: Bloody Mary and appeared with Noah Wyle and Illeana Douglas in the 2005 film The Californians. Her supporting role as the daughter of Heath Ledger's character in the Academy Award-winning film Brokeback Mountain that year brought her more widespread critical notice. Mara signed with the William Morris Agency, and was included on the New York Daily News list of "10 young actors who have a shot at making it big" at the start of 2006. She appeared in Zoom that year as Summer Jones (aka Wonder), a 16-year-old girl with telekinetic and empathic abilities. She next appeared in We Are Marshall, starring Matthew McConaughey, which recalled the aftermath of the 1970 Marshall University plane crash that took the lives of most of the football team. Mara played cheerleader Annie Cantrell. In 2007, she appeared in the comedy Full of It with Ryan Pinkston for New Line Cinema. The film later aired on television as Big Liar on Campus. Mara was also featured in an advertising campaign for clothing retailer Gap called, "khakis with attitude." She appeared in Shooter, a thriller about a master sniper portrayed by Mark Wahlberg, lured out of retirement to prevent an assassination. Mara played a Kentucky widow, Sarah Fenn, adopting a southern accent for the role. Also in 2007, she finished her work in the film Transsiberian by Brad Anderson, which takes place on the Trans-Siberian Railway that runs from China to Moscow. She spent three months shooting the thriller in Vilnius, Lithuania, starting in December 2006. The film also shot on location in Beijing and Russia. Mara played Abby, a 20-year-old runaway from Seattle. Transsiberian premiered at the 2008 Sundance Film Festival in January 2008. Mara starred in the 2008 film Stone of Destiny, written and directed by Charles Martin Smith, about the theft of the Stone of Scone on Christmas Day, 1950. Mara played Kay Matheson, one of four students that removed the stone in a Scottish nationalist plot. The period adventure-comedy co-starred Billy Boyd, Robert Carlyle and Charlie Cox. Filming began in June 2007 in locations around Glasgow. Mara felt lucky and proud to play a role that was important to people's heritage. She stayed near the Botanic Gardens in the city's West End while filming, attending the film premiere at the Edinburgh International Film Festival on June 21, 2008. The film closed the 2008 Toronto International Film Festival on September 13, 2008. In December 2008, Mara appeared in T Takes: Brooklyn 09, a series of 6 improvised short films directed by Brody Baker. She starred in The Open Road as Lucy. In 2009, Mara filmed the independent comedy Peep World, starring Michael C. Hall, Sarah Silverman and Rainn Wilson, and joined the cast of Marvel's Iron Man 2, making a cameo appearance as a U.S. Marshal who serves Tony Stark a subpoena. Mara shot the ensemble romantic comedy Happy. Thank You. More. Please. in New York City in July 2009. She plays a waitress and aspiring singer named Mississippi, in a story about six single New Yorkers in their 20s. The film was written and directed by actor Josh Radnor (How I Met Your Mother). The film won the U.S. Dramatic Audience Award at the 2010 Sundance Film Festival. In 2010, Mara played hiker Kristi Moore in the survival drama 127 Hours, a true story directed by Danny Boyle about Aron Ralston, a climber trapped while mountaineering in Utah. Mara appeared in Ironclad (2011), which tells the story of the siege of Rochester Castle by King John in the year 1215. It is her first film where she speaks in an English accent. Mara appeared in the short film Ten Year, produced by Channing Tatum to attract financing for a feature film. The full-length feature went into production in Albuquerque in January 2010, with Mara starring in a large ensemble cast film about a 10-year high school reunion. In 2012, Mara starred in Stefan Ruzowitzky's thriller Deadfall with Eric Bana and Olivia Wilde. In 2013, Mara starred in Broken Bells video for the song Holding On For Life. Mara appeared in Transcendence (2014), starring Johnny Depp and directed by Wally Pfister. In 2015, she played Sue Storm, the Invisible Woman in a reboot of the Fantastic Four. In that year, she also had a supporting role as astronaut Beth Johanssen in director Ridley Scott's film The Martian. She also starred as Ashley Smith in the movie Captive. In 2017, Mara starred in Megan Leavey, playing Megan Leavey, a real-life U.S. marine who bonded with her military working dog. The film was directed by Gabriela Cowperthwaite, and released on June 9, 2017. She also starred alongside Ellen Page in My Days of Mercy, which she co-produced. In late 2015, Mara began dating her Fantastic Four co-star Jamie Bell and in January 2017, the couple got engaged. On July 17, 2017, the couple announced that they had married. As a result, Mara became the stepmother to Bell's son from his marriage to Evan Rachel Wood. On January 9, 2019 it was reported that Mara and Bell were expecting their first child together. Mara lives in Los Angeles and Manhattan. She credits her vegan diet and regular workouts for keeping herself fit. "I'm a massive animal lover, too," she explained. "Being vegan has been so good for me. I've never felt better." Mara has stated she comes from a "huge" family; her father is one of 11 children, and she has 22 aunts and uncles and 40 cousins. As a descendant of the owners of the New York Giants and Pittsburgh Steelers, Mara is a fan of both teams; she joked, "If I'm mad at my mom I root for the Giants, and if I'm pissed at my dad I root for the Steelers." This relationship contributed to her being cast in We Are Marshall. Mara has sung at both teams' games, and after missing the Steelers' 2006 victory at Super Bowl XL due to work, her contracts now state that she can attend if either team goes to the Super Bowl. She was in attendance for the Giants' victory in Super Bowl XLII, the Steelers' victory the next year in Super Bowl XLIII, and the Giants' victory in Super Bowl XLVI. Mara is one of the faces of the Humane Society of the United States. In 2015, she was featured in one of their campaign videos to promote Meatless Monday. 1997 Law & Order Jenna Erlich Episode: "Shadow"
2000 Madigan Men Julie Episode: "White Knight"
2000 Ed Kelly Kovacs Episode: "Pretty Girls and Waffles"
2001 Law & Order: Special Victims Unit Lori Episode: "Pixies"
2003 Cold Case Jill Shelby Episode: "Look Again"
2003 Boston Public Helena Gelbke Episode: "Chapter Seventy-Five"
2004 CSI: Miami Stephanie Brooks Episode: "Murder in a Flash"
2004 CSI: Crime Scene Investigation Janelle Macklin Episode: "Formalities"
^ Josh Horowitz (February 23, 2014). "Kate Mara". Happy Sad Confused (Podcast). SoundCloud. Event occurs at 1:53. Retrieved August 11, 2015. ^ "Kate Mara". TV Guide. Retrieved September 1, 2014. ^ ONE Media (December 20, 2017). "CHAPPAQUIDDICK Official Trailer (2018) Kate Mara, Kennedy Biography Movie HD" – via YouTube. ^ ONE Media (February 28, 2018). "CHAPPAQUIDDICK Official Trailer # 2 (2018) Kate Mara, Kennedy Biography Movie HD" – via YouTube. ^ "Exclusive interview with Kate Mara co-star of Channing Tatum in "10 Years" - VIDEO". September 21, 2012. ^ "7 celebrities you didn't know had Irish roots". December 14, 2016. ^ "Steelers, Giants memorabilia auctioned to help Kenyan orphans". December 11, 2008. Pittsburgh Post-Gazette. ^ a b Staple, Arthur (January 30, 2009). "Rooney Mara links NFL's two royal families". Newsday. Archived from the original on February 3, 2009. Retrieved January 31, 2009. ^ "Eileen Hawthorn Engaged to Wed T. J. Rooney Jr". The New York Times. November 5, 1989. ^ a b Lynch, Lorrie (July 30, 2006). "Who's News"[permanent dead link]. USA Weekend. Retrieved February 27, 2007. ^ Nip/Tuck media guide. 2003. FX Networks. ^ Cabot, Tyler (January 29, 2009). "Kate Mara Is Ready for the Super Bowl". Esquire. Retrieved January 31, 2007. ^ Warn, Sarah (September 2003). "Nip/Tuck Increases Lesbian Visibility by Leaps/Bounds Archived September 20, 2008, at the Wayback Machine". AfterEllen.com. Retrieved on September 7, 2008. ^ "Casting Call". March 4, 2004. The Hollywood Reporter. ^ O'Connor, Mickey (April 25, 2009). "Entourage News: 24 Alumna Clocks In as E's Assistant". TV Guide. Retrieved April 25, 2009. ^ a b "The Rumble". July 12, 2009. New York Post. Retrieved on July 12, 2009. ^ Donnelly, Matt (December 19, 2011). "Kate Mara on the Rooney Mara rivalry, 'American Horror Story'". Los Angeles Times. Retrieved December 22, 2011. ^ Andreeva, Nellie (February 1, 2012). "Jennifer Finnigan Joins David E. Kelley TNT Pilot, Kate Mara in Netflix 'House of Cards'". Deadline Hollywood. Retrieved February 7, 2012. ^ Brantley, Ben (July 19, 2003). "The Allure Of an Empty Paradise". The New York Times. Retrieved February 23, 2007. ^ "'The Alice Complex' to Star Elbrick and Banes". Broadwayworld.com. July 18, 2008. ^ a b Francesa, Mike; Russo, Chris (December 11, 2006). "The Fan – Kate Mara interview". Mike and the Mad Dog. ^ Dodd, Stacy (January 13, 2006). "Kate Mara". Variety. Retrieved February 27, 2007. ^ Mills, Nancy (January 1, 2006). "LET 'EM SHINE. Here's our annual roundup of 10 young actors who have a shot at making it big". New York Daily News. Retrieved August 4, 2015. ^ a b Smith, Krista (September 2006). "The Vanities Girls: Kara Mara". Vanity Fair. Retrieved July 12, 2007. ^ O'Loughlin, Sandra (January 19, 2007). "Gap Campaign Features Khakis and Attitude". Brandweek. Retrieved March 18, 2007. ^ Fleming, Michael (April 11, 2006). "'Shooter' Targets Mara". Variety. Retrieved February 27, 2007. ^ Hopewell, John & Fleming, Michael (November 30, 2006). "Cast aboard for Anderson". Variety. Retrieved on February 27, 2007. ^ "Kate Mara Interview, Shooter". MoviesOnline. Retrieved on March 27, 2007. ^ Pendreigh, Brian (June 17, 2007). "Romancing the Stone: Scots heist destined for Hollywood". Scotland on Sunday. Archived from the original on October 13, 2007. Retrieved June 17, 2007. ^ "Stone of Destiny film under way". BBC News. June 29, 2007. Retrieved June 29, 2007. ^ Barnard, Linda (February 17, 2009). "Her role carried weight of history". Toronto Star. Retrieved February 18, 2009. ^ "Kate Mara interview". The Late Late Show with Craig Ferguson. August 12, 2008. ^ "Destiny calls stars to premiere of Scone stone film". Edinburgh Evening News. June 21, 2008. Retrieved June 21, 2008. ^ "T Takes". T. Retrieved on April 23, 2009. ^ Lambert, Mark (March 4, 2008). "Justin Timberlake Shakes Up Southern Town". People. Retrieved February 25, 2008. ^ "Showbiz people briefs". April 23, 2009. Reuters. Retrieved April 23, 2009. ^ Marnell, Blair (January 7, 2010). ""War Machine Creator Says 'Iron Man 3' Could Use 'Demon In A Bottle' Story, Debunks 'Iron Man 2' Rumor". MTV. Retrieved January 8, 2010. ^ a b Fernandez, Jay A.; & Kit, Borys (February 12, 2010). "Kate Mara in talks for Boyle's '127 Hours'". Reuters. Retrieved February 12, 2010. ^ Woodrow, Emily (October 24, 2009). "Medieval battle scenes in the Valleywood mud Archived October 7, 2012, at the Wayback Machine". South Wales Echo. Retrieved on October 26, 2009. ^ Medina, Marcy (April 6, 2010). "The Cast of Indie Hopeful 'HappyThankYouMorePlease". Women's Wear Daily. Retrieved on April 6, 2010. ^ Fleming, Mike (October 19, 2010). "Channing Tatum Has 'Ten Year' Feature Itch". Deadline Hollywood. Retrieved October 20, 2010. ^ 'Ten Year' shooting begins in Albuquerque[permanent dead link]. KWES. Associated Press. January 6, 2011. ^ Thompson, Bob (April 16, 2011). "Eric Bana can be whatever you need him to be". National Post. Archived from the original on July 7, 2012. Retrieved November 4, 2011. ^ Chan, Stephanie (November 30, 2012). "Eric Bana, Olivia Wilde, Kate Mara, Sissy Spacek and Kris Kristofferson take part in the intense dinner table scene for director Stefan Ruzowitzky's thriller". The Hollywood Reporter. Retrieved April 19, 2013. ^ Kate Mara Boards Johnny Depp Project ‘Transcendence’, Variety. ^ McNary, Dave (January 11, 2017). "Kate Mara Iraq War Hero Biopic 'Megan Leavey' Gets Release Date". Variety. Retrieved January 11, 2017. ^ McNary, Dave (August 18, 2016). "Tali Shalom Ezer Directing Ellen Page and Kate Mara in Romantic Drama 'Mercy'". Variety. Retrieved January 13, 2017. ^ Nessif, Bruna. "Jamie Bell Says He's Not Engaged to Girlfriend Kate Mara Despite Her Ring on That Finger". E!. ^ Woo, Kelly (January 13, 2017). "'Fantastic Four' Co-Stars Kate Mara and Jamie Bell Get Engaged". moviefone. Retrieved January 13, 2017. ^ Miller, Mike (July 17, 2017). "Kate Mara and Jamie Bell Tie the Knot in Surprise Ceremony". People. Retrieved July 17, 2017. ^ Kirkpatrick, Emily (January 9, 2019). "Kate Mara expecting first child with Jamie Bell". Page Six. Retrieved January 9, 2019. ^ "After an eye-catching turn on the Netflix hit House of Cards, Kate Mara has a few more tricks up her sleeve". Modernluxury.com. Retrieved October 30, 2014. ^ "ROONEY MARA FAMILY TREE". Pittsburgh Post-Gazette. February 4, 2012. Archived from the original on February 8, 2012. Retrieved February 9, 2012. ^ "Kate Mara verified Twitter Account". Twitter. Retrieved October 30, 2014. ^ Jennifer Chan, "What's Trending with Kate Mara: Orlane Skin Care, Bar Method Workouts and More," EOnline, December 17, 2013. ^ Pringle, Gill (April 25, 2014). "House of Cards' Kate Mara: 'It is complicated being compared to my sister Rooney'". The Independent. Retrieved June 8, 2015. ^ Tucker, Reed (January 8, 2009). "Kate and Rooney Mara Are Pigskin Princesses". New York Post. Retrieved April 23, 2009. ^ "Tracy Morgan, Kate Mara, Birds of Tokyo". Jimmy Kimmel Live. April 9, 2014. ABC. ^ a b Anderson, Shelly (December 25, 2006). 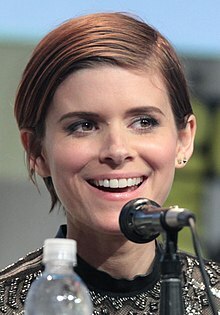 "Rooney connection brings Kate Mara to Pittsburgh". Pittsburgh Post-Gazette. Retrieved February 7, 2011. ^ Alt, Eric (May 2006). "Kate Mara". Nylon Magazine. ^ "Kate Mara, Nikki Reed, Ian Somerhalder and Moby Celebrate New Farm Animal Protection Laws". The Humane Society of the United States. January 5, 2015. Retrieved March 25, 2015. ^ Wayne Pacelle (March 2, 2015). "Is Industrialized Agriculture a House of Cards?". The Humane Society of the United States. Retrieved March 25, 2015. Kernan, Kevin (September 24, 2006). "Hollywood Giant". New York Post. Vranish, Jane (February 26, 2006). ""The Insiders: 2/26/06"". Pittsburgh Post-Gazette.